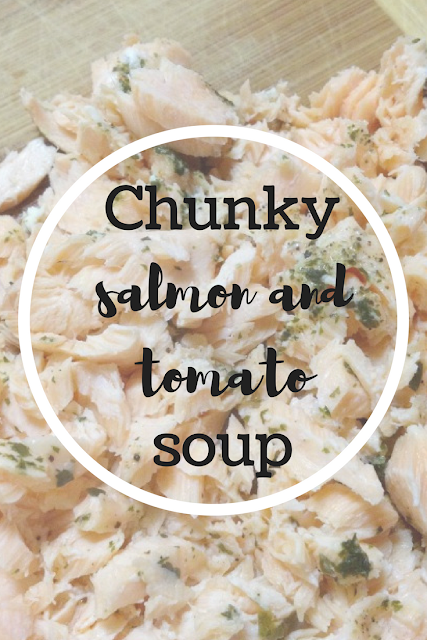 Salmon and tomato aren't the most traditional pairing I know, but I really love the taste of this recipe. It took me ages to devise a name for it because it's quite a versatile dish - it can be used as a chunky soup, a pasta sauce, as a pizza topping, anything really. They all taste delicious IMO, but I make it most often as a soup. Salmon has so many beneficial properties, but honestly? I find the taste of cooked salmon a little too strong for my liking. Mixing it in with the ingredients of this soup mutes the flavour a little, so it still comes through but without being overpowering. 1.) Preheat the oven to 200 degrees celsius (180 for a fan oven). 2.) Place the salmon skin side down on a sheet of foil. Pour a teaspoon of extra virgin olive oil over it and rub in with the back of the spoon. Squeeze a little bit of lemon juice and sprinkle a little bit of sea salt, ground black pepper and parsley over the top. 3.) Loosely wrap the foil around the salmon so that it comes together at the top. Place in the oven for 20 minutes. 4.) Whilst that cooks, finely chop the onion and garlic. 5.) Heat the second teaspoon of extra virgin olive oil in a saucepan. Add the onion and garlic and cook until softened. 6.) Add the chopped tomatoes and leave to simmer for 15 minutes. 7.) Take the salmon out from the oven, unwrap and finely chop. 8.) Add the salmon, basil and chili to the tomato mixture and stir.